This post contains affiliate links. Using them to shop is a great way to support this site. canola oil: is artificially engineered from genetically modified rapeseed plants, sponsored by the Canadian government. Combining “Canada” + “ola,” (oil) is how Canola oil got its name. It is chemically processed and goes through bleaching and degumming processing and because it is so chemically unstable, it is also deodorized using high temperatures &/or chemicals of questionable safety. Consumers do not know that canola oil contains trans fatty acids because they are not listed on the label. I could go on, but I don't think I need to. Stay far away from Canola oil. maltodextrin: an artificially produced highly processed thickener, filler, & preservative often made from genetically modified corn that has no nutritional value & spikes blood sugar. natamycin: an antifungal preservative banned by Whole Foods. roasted nuts: Unless your nuts are specifically labeled ‘dry roasted,' most ‘roasted nuts' are not roasted at all but rather fried in unstable vegetable oils which cause inflammation. A much better choice is to buy fresh raw nuts and just toast them yourself. It will take you 5 minutes. Doing so really turns up the flavor in any dish you add them to. 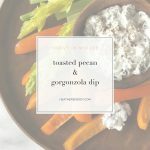 I recreated the flavor profile of this dip in my own kitchen using fresh and whole foods ingredients without all the yucky additives and preservatives and it's no surprise that mine tastes WAY better. I toasted instead of roasted the pecans (big difference in taste!) and I used gorgonzola instead of Blue cheese because I think it goes better with the toasty pecan flavor, but feel free to use Blue cheese if you prefer it. It's super easy to pull together in a few minutes. I pair it with chilled and crunchy celery sticks. If you prefer your dip a little thinner, just add more sour cream. Heat a medium fry pan over medium heat. Add pecans and toast, tossing occasionally until fragrant and just starting to brown. Remove from heat. In a medium-sized bowl add all the ingredients together and mix until well combined. Store in the refrigerator covered for up to five days. 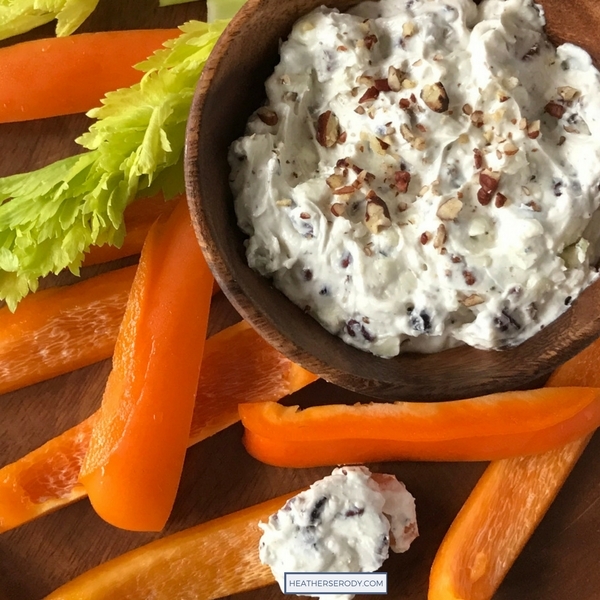 After refrigerating, allow the dip to come to room temperature before eating so it softens.